Accueil Produits Bande originale La bande originale de “Un visiteur chez le Roi Arthur”. La bande originale de “Un visiteur chez le Roi Arthur”. Sortie : 25 juillet 1995. Film : Un visiteur chez le Roi Arthur. 1. 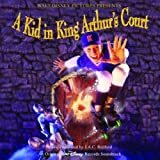 Main Title – A Kid In King Arthur’s Court – 2:46. 2. Strike Out / Earthquake – 2:57. 3. Captured In Camelot – 3:12. 4. Combat Rock – 2:27. 5. Now Let Us Eat! – 2:04. 6. Merlin’s Lair – 2:30. 7. Two Modest Proposals – 2:36. 8. Successful Swording – 1:25. 9. The Law Of The Land – 1:55. 10. Calvin And Katie – 2:53. 11. The Plot Thickens – 4:30. 12. Between You And Me / Under Arrest – 2:34. 13. You Do Care – 1:31. 14. Horses To Water – 1:34. 15. Rescuing Katie – 4:08. 16. The Fight In The Castle / Sir Calvin Of Reseda – 3:38. 17. The Tournament – 4:35. 18. Black Magic – 1:59. 19. In Shining Armor – 2:22. 20. Warm Goodbyes / Home Run – 4:16. 21. A Kid In King Arthur’s Court (End Title) – 3:04. 22. The Conscience Of The King – 4:33.